GreenGuard was launched in 2000 by Atlanta-based for-profit Air Quality Sciences (AQS), which is now a separate not-for-profit organization. Although GreenGuard was not designed specifically for fabrics, it is often advertised that a fabric is GreenGuard certified, because GreenGuard certified products can automatically meet the requirements of LEED 2009 CI Credit 4.5 and BIFMA X7.1. 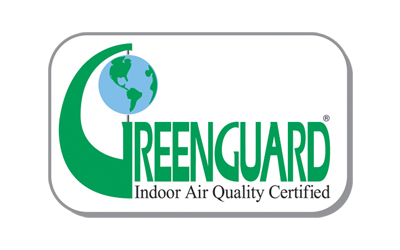 GreenGuard has developed proprietary indoor air-quality pollutant guidelines based on standards developed by the government and by industrial bodies. Maximum allowable emission levels in air concentrations, according to their website, are based on those required by the state of Washington‘s indoor air quality program for new construction, the U. S. EPA’s procurements specifications, the recommendations from the World Health Organization, Germany’s Blue Angel Program, LEED for New Construction (LEED-NC) and LEED for Commercial Interiors (LEED-CI). Those products that pay the testing fee and pass muster earn the right to call themselves GreenGuard certified. The GreenGuard Product Guide has become a purchasing tool for thousands of specifiers as they depend on it to preselect environmentally preferable products. It does not measure phthalates except in the Children and Schools certification; phthalates are semi volatile, and don’t begin to evaporate until approximately 7 days after exposure to the air. Americans spend 90 percent of their time indoors, and indoor air can be as much as 100 times more polluted than outdoor air, this issue must be taken seriously by designers. It is incumbent on them to specify products (including fabrics) that are low-emitters of formaldehyde and all the other volatile organic compounds that contribute to poor indoor air. But it is also true that air quality is not the only contributor to poor health, productivity and quality of life of the occupants of indoor spaces – after all, our skin is the largest organ in our bodies, and it’s quite permeable. So designers should not take this certification as assurance that a product is the best environmental choice – not only does it bypass those chemicals that do not evaporate, it does not look at the production of the fabric, any social justice issues, nor does it look at carbon footprint. Indeed, a product containing PVC, one of the most toxic substances known – highly toxic in all its phases: manufacture, use, and disposal – can be GreenGuard certified. According to GreenGuard itself, as is published on their web site: GreenGuard is a product emissions performance-based standard, and as such, the complete toxicity effects of the chemical emissions from the products tested are beyond its scope. So what are the take aways? Remember that GreenGuard tests for emitting chemicals only, and they do that very well. But it should not be used as a tool to evaluate a product’s environmental impact and safety.